It is true that the impression on anyone coming to Venice for the first time is unforgettable. Whether one arrives from the mainland crossing the lagoon in the train by the railway bridge, or moors in the heart of the city from the sea, the vision of this incomparable cityis an enchantment.With its 150 canals and 400 bridges this is a unique urban masterpiece which has canals instead of streets, boats instead of buses, and old bridges instead of subways. A wondrously unique city to please every one of the senses..a “must” for every traveller! Discover Venice and its landmarks with Italy’s Best guides who will provide the perfect historical and artistic introduction to the city. Exuberant, elegant and stylish, the city of Marco Polo, of the carnival, of 16th century masterpieces and stunning contemporary artworks, which line the banks of its canals. St Mark’s Square, the Doge’s Palace, the Grand Canal, the Bridge of Sighs, the gondolas, the lace of Burano and the glass of Murano, all contribute to the charm of the ancient capital of the “Serenissima.” With 150 canals and 400 bridges, this unique urban masterpiece, which has waterways instead of roads, boats instead of buses, and old bridges instead of subways, has been a powerful economic force for over eleven hundred years. Venice formed an important bridge between the east and west, where both goods and cultural traditions were exchanged, as can be witnessed in the arabesque motifs in the churches, or the Byzantine mosaics which adorn public, private and ecclesiastical buildings. An ancient city, which enthusiastically embraces the modern world, Venice is home to both museums, churches and public structures filled with 16th century masterpieces, and also to the Biennale, where artworks by the world’s most innovative living artists are exhibited. This Secret Itineraries Tour of the Doge’s Palace is followed by a mask making workshop, making a perfect day for the entire family. Enjoy this visit to the Doge’s Palace on the Secret Itinerary tour to view areas of the palace normally closed to the public. Start your secret reconnaissance in the Office of the Doge’s Secretary, the assistant to many of Venice’s ministers. Move on to the rooms of the Deputy of the Secret Works of the Council of Ten. See the Office of the Grand Chancellor, the only Venetian official elected directly by the Grand Council. Explore the Secret Chancellery where cupboard-covered walls were once filled with documents charting both public acts and secret deals. Continue from the Salon of the Regent to the Chancellery to some of Venice’s more sinister secrets, starting with the Torture Room. Get privileged insights into the Piombi, the attic prison where Casanova, Venice’s famous lover and writer, was kept for months before he managed a successful escape. Visit the attic at Ponte della Paglia where the walls bear coats of arms. Marvel at the Inquisitors’ Room’s beautiful ceiling, decorated by Tintoretto. Finish this exclusive tour at the Room of the Three Heads. A half-day excursion to the islands of Murano and Burano in Venice, including a visit to a glass-blowing factory. Explore the famous islands of Venice lagoon (Murano, Burano and Torcello) on a private comfortable motor boat. Enjoy privileged, personalized attention from your expert English-speaking guide on this special private tour of Venice’s islands. Visit a glass-blowing factory to see how age-old techniques are used to create exquisite pieces of art. Visit the Museo Vetrario, one of the world’s largest Venetian glass collections, inside the impressive 17th-century Palazzo Giustinian. Take a boat ride to the neighboring island of Burano. Enjoy a complete tour of the island while soaking up the charm of this fishing town complete with nets and sail cloths, and learn about a tombolo, the local lace-making technique. Enjoy exclusive visit to marble and mosaic workshops during this private Venice artisan tour, including the only remaining glass furnace in Venice. 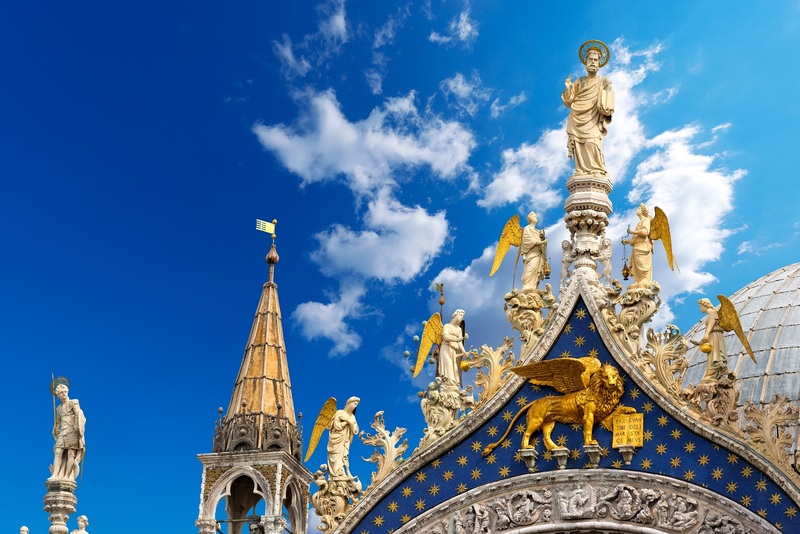 Tour St. Mark’s Basilica after hours with this exclusive experience from Italy’s Best. Enjoy a private tour with a VIP opening of St. Mark’s in Venice. With its boats, canals, islands, ancient mansions and mysterious alleyways, Venice is like a child’s fairytale come true. This tour offers an entertaining and informative look at Venice’s illustrious maritime past that is fun for the entire family.